Pure, natural light and the colors of nature are the driving forces behind Mike's art. To maintain the integrity and purity of the work, Mike shoots only with color slide film, and uses no color filters or darkroom manipulations to enhance or change the images that were composed in the viewfinder. As such, his portfolio is a true representation of an artist's ability to create imaginative, powerful images by combining his unique ability to see art in nature with the mastery of his equipment. His expertise with both underwater and conventional photographic equipment allows for a level of diversity rarely found in professional fine art photography. Mike graduated with a Bachelor of Science degree in Marine Biology from California State University of Long Beach. Before becoming a professional photographer, he was a sport fish Research Biologist for the California Department of Fish and Game as well as a member of the Mammalogy staff at Seaworld, San Diego. His insight and understanding of marine wildlife as well as animal behavior enable him to capture wildlife in a truly unique fashion. Mike has been a certified SCUBA diver for 40 years, a surfer for over fifty years and a competitive triathlete since 1982. His extensive experience and capability in the water have allowed him to photograph giant waves on the north shore of Oahu, schools of sharks in the Tuamotu Archipelago and many other challenging subjects that are generally unattainable to most fine art photographers. 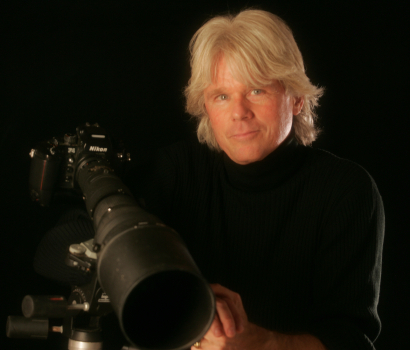 Up until his trip to East Africa in June 2004, all of Mike's work was done with professional 35mm Nikon equipment. For the Africa trip, Mike added a medium format panoramic camera to his arsenal. To ensure maximum sharpness Mike shoots only with low ASA professional slide film.